I began collecting Anne Kilham’s postcards in the early 1980s when we lived in Augusta. I loved how she used gorgeous saturated colors to portray classic coastal Maine scenes. As I acquired more postcards, I began to realize how skillful she was at capturing snow scenes in winter sunlight on those short, cold snowy winter days. After we moved to Arlington, VA, in 1983, I recall vacationing in Maine and loading up the car with sea shells, nautical treasures, fabric by the pound, thrift shop finds, and more Anne Kilham. As more and more shops added her calendars, post cards, gift cards, and note cards, I scooped up all her designs. I also started collecting her Advent calendars, because she portrayed Christmas in a festive, yet timeless way. 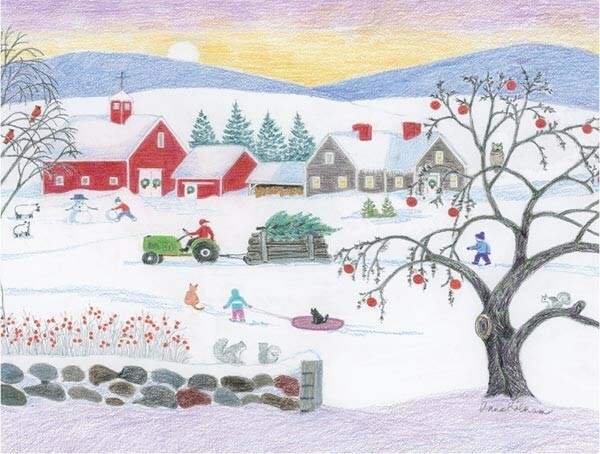 The uniqueness of Anne Kilham’s talent is in how she gives color to the stoic beauty of New England, each season its own palette and each set to its own melody of rhythm and soul. There is a quiet comfort in Anne’s images, whether they’re gardens of colorful flowers, meadows that melt into the ocean, or lighthouses surrounded by lupines, ledge and ocean. If there’s a chair in an Anne Kilham painting, you want to sit in it. Although Anne’s original designs were handprinted blockprints, she works mostly in watercolors today. She usually begins with photographs, many photographs, that she lays out before making her first sketches. Once the sketch meets Anne’s expectation, she is ready to create an Anne Kilham original. Anne was born in Sante Fe, New Mexico, grew up in eastern Massachusetts and lived in Rhode Island before moving to Rockport. She comes from a family of creative people: artists, architects, engineers and inventors, and credits their willingness to offer criticism with the honing of her talent. Teachers at Colorado College and the Rhode Island School of Design contributed to her understanding of composition and color.